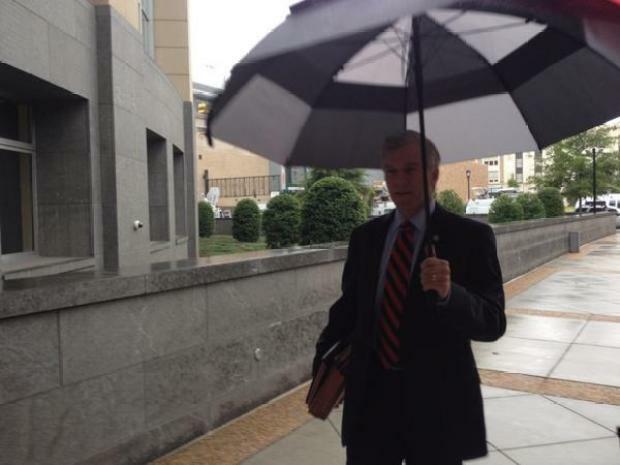 Prosecutors in the corruption trial of former Virginia Gov. Bob McDonnell and his wife, Maureen, announced they will rest their case Thursday. Jurors have Friday off while a motion is argued; the defense plans to begin their case Monday. The announcement came as the trial entered its 13th day Wednesday, a day after prosecutors presented what they say is another example of gifts the couple accepted from a businessman who says he sought their help to promote his product. Donnie Williams, the brother of ex-Star Scientific CEO Jonnie Williams, testified Tuesday that that he worked at Bob and Maureen McDonnell’s private home about a dozen times in 2012 and 2013. In one text message exchange between Donnie Williams and Maureen McDonnell, the first lady asked if she needed to provide a credit card for a new spa cover. Donnie Williams replied that his brother was paying for it. Once the investigation into Jonnie Williams’ gifts began, Maureen McDonnell asked for an invoice and paid up, Donnie Williams testified. Before the investigation became public, Maureen McDonnell did not pay him for anything, Donnie Williams said, although she offered to pay for his work several times. Northern Virginia Bureau Chief Julie Carey reports on the former Virginia attorney general testifying at the McDonnell corruption trial. The McDonnells are charged in a 14-count indictment with accepting more than $165,000 in gifts and loans from Jonnie Williams in exchange for promoting his company's nutritional supplements, in particular one known as Anatabloc. On Tuesday, prosecutors also heard from the Virginia State Police special agent who first questioned Maureen McDonnell about some of the checks from Jonnie Williams. On Feb. 15, 2013, Maureen McDonnell was only expecting to answer questions about an embezzling case involving the former chef of the governor’s mansion. When Charles Hagan began asking about Jonnie Williams, the first lady told him her husband was longtime friends with Williams, though they’d only met a few years earlier. "She said the $50,000 check was a personal loan to her,” Hagan testified. “Jonnie Williams had provided the money and she had signed a loan agreement and was making periodic payments on the loan." The investigation later showed much of that was untrue. Day 12 of the corruption trial began with courtroom drama and a delay in proceedings as one of the jurors was dismissed. U.S. District Judge James Spencer met twice in chambers with prosecutors and lawyers for the former governor and his wife for an extended time. Between the two closed meetings, a somber Bob McDonnell sat at the defense table with his back to his wife and stared at the wall for several minutes. He looked visibly upset when the conference was over. When Judge James Spencer came onto the bench, he revealed that a juror had been dismissed and would be replaced by one of the three remaining alternates. No reason was given. Another juror had been excused just as they were seated at the start of the trial. When court proceedings got underway Tuesday, former Virginia Attorney General Jerry Kilgore returned to the stand and wrapped up testimony about his time working for Williams. Kilgore, who left office in 2005, was hired by Williams in 2011 to try to find state money to conduct research on Anatabloc. Kilgore testified he proposed a two pronged plan: getting grant money from the tobacco commission or convincing the governor to add a request for research funds to his state budget proposal. Through cross-examination, lawyers for both Bob and Maureen McDonnell were able to underscore the fact that Kilgore never succeeded in getting Williams what they'd discussed. Kilgore testified he never asked for a meeting with Bob McDonnell because University of Virginia researchers were not on board with doing Anatabloc research. Asked John Brownlee, "Nothing happened, did it?" Brownlee pointed out that if the governor had wanted to act, he could have easily sought research funding in the budget. Defense attorneys also showed it was Kilgore, not McDonnell, who urged Williams to try to get UVA and Virginia Commonwealth University interested in doing Anatabloc research. "I suggested VCU or UVA," said Kilgore. But prosecutor Michael Dry brought Kilgore back to a key point in his redirect, asking, "In his conversations, who was [Williams] telling you supported the product?" Kilgore answered, "The governor and first lady." It was the second partial day of testimony for Kilgore, who said Monday that Williams repeatedly told him the McDonnells supported his efforts. Another witness Tuesday was one of the doctors Williams was trying to get interested in doing research. VCU cardiologist Dr. George Vetrovec had agreed to meet with Williams to learn about Anatabloc. Vetrovec testified, "Mr. Williams said to me, 'How much time do you have?' I said, '30 minutes.' He said, 'Make it 45. The governor's wife makes really good cookies'." After that, Vetrovec said Williams drove him directly to the governor's mansion. Inside, there were no cookdies -- but there was a reception for Steven Spielberg, who was filming the movie "Lincoln" in Richmond. Vetrovec said Williams asked Maureen McDonnell to take them to the front of the line, where he met the famed Spielberg. But under cross examination, Vetrovec said neither of the McDonnells ever talked to him about Anatabloc.